L got her 1st P1 spelling tests for her English & Chinese last Friday and she scored full marks for both! Well done Sweetie! For 听写, they don't write the Chinese character but the hanyupinyin. I think she has tougher 听写 during K2, which she has to write the Chinese character. I think have to practice the writing with her otherwise she wouldn't be able to write or recognise them. I am glad I send her for the enrichment class, she started her hanyupinyin spelling earlier and the words were similar to what the school has given. 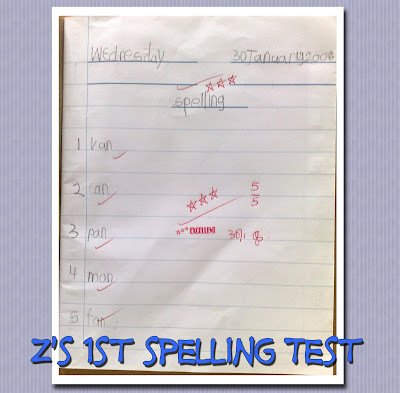 Z did his 1ST spelling test today and I totally forgot about it! As I have mentioned earlier, he is able to spell out the words using phonics. Noticed his handwriting? It wasn't that neat few weeks ago. Thanks to his teacher, Ms B :) She is very strict with the handwriting. If he write 'uneven' words, his teacher will highlight it on his worksheets. To think that I complained abt this to LZdaddy then :p Now, Z is very particular with the way he writes, especially when he is doing his schoolwork. LZ were having their enrichment class today and I decided to buy some stuffs for CNY (Chinese New Year). CNY is coming and there is so many things to buy on my list! Him : You are in luck! I am going to ask you a question and if you get it right, I will give you a 红包 (red packet)! Me: OK... But there is lots of things I don't know abt new year tradition. Thinking that he will ask about the tradition, so silly right? Him : Very easy! Now, what is the 红包 colour that we are giving out here? Him : 恭喜你! You have won a $68 shopping voucher! Jean was asking me abt the little 'feet', so I posted another pic pointing to it :) Idy asked for the recipe and here is the link. 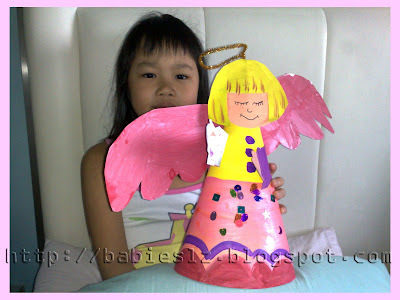 The blogger posted a very detailed post on the step-by-step and with pics too. I decided to prepare this, knowing that she would be very happy when I pack rice for her. Daddy is on MC for 3 days.... He is suffering from Gout. He called late morning and told me that his colleagues will be sending him home as his foot was very swollen and he was unable to drive. Doc gave him 3 days MC but he has so much work to do... He will be working from home instead of resting. Z is just like daddy... A meat eater. Given a choice, they will not have vegetables on their plates. I always make an effort to cook at least 1 veg dish. As daddy has his lunch outside, I can't control what he eats.... :( Z, on the other hand, is better. He has his meal at home most of the time. Daddy is also like a camel, he doesn't take water unless you place a glass of it in front of him. When I read through all the food that he has to avoid, I wonder what I should be cooking..... ONE consolation is that daddy doesn't drink unless he has to entertain. I hope he will recover soon as Chinese New Year is coming and for his health too.... I can imagine he will drooling over the food that will be place on the table. LZdaddy, it is time for you to cut down on the meat and time for you to put on your jogging shoes. Watch what you eat too ok? When Will He Change His Mind? LZ spent some time with my dad in the morning and LZdaddy took care of them while I have some ME time, to perm/colour/cut my hair! I spent 5+hr sitting on the chair and bums aching. Hehehe.... I'm not complaining ;) How often do I get to do this? :) I have to make arrangement before I could have this luxury. Me : I cut my hair short ok? L : Like daddy''s hair, so short? Me : Not that short, maybe a little longer. Can? L : Yeah! Mommy going to cut her hair short! Z : Mommy, you cannot cut your hair short! If you cut, I will not hug and kiss you! Z : Mommy, did you cut your hair very short? Z started ''checking'' on my hair. Z : Why here so short? You cut it short! 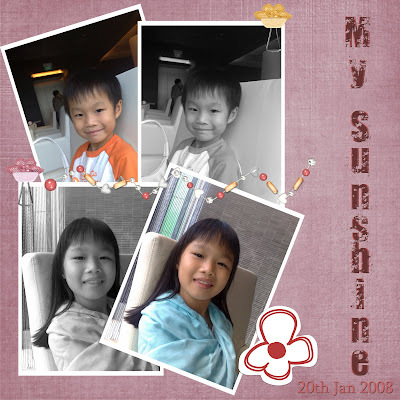 On Monday, halfway through swimming, L cried coz she had a very bad toothache. It must be very painful... Since baby, she didn't cry whenever she went for injections. Remember I asked if I should pull out the tooth? If I had brought her to the dentist earlier, sh would not have toothache. Sorry Sweetie.... I thought so long there is no pain, it should be alright for her to wait for the tooth to drop off on its own. Some friends were telling me to wait too. I managed to make an appointment for her yesterday. She didn't feel the pain as Doc applied the gel. She didn't even know when Doc has extracted it! 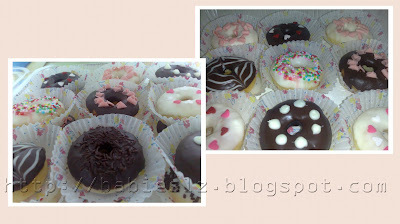 :) I must say that L did very well :) She didn't cry at all! L : Mommy mommy! Did the tooth fairy visit me last night? Me: (Oops!) I think so... Why don't you wash up first and check later? I forgot about it! Immediately, I took a $10 note and placed it under her pillow. I heard it should be 50 cents but at that moment, it slipped my mind and I simply took the money out of my purse. L : Mommy! The tooth fairy came last night! Yeah! She took my tooth and she gave me money! 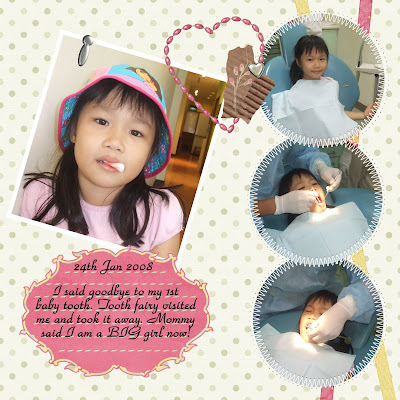 L replied : Didi, you will have to wait till your tooth drop then tooth fairy will visit you. What's In the Snack Box? 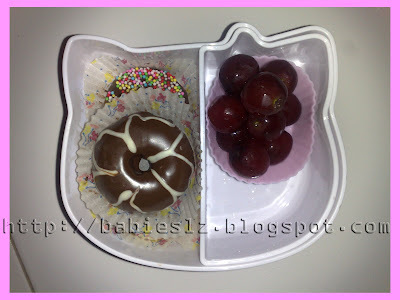 Since I baked donuts for the party and L loves it, I packed some for her snack box. We were late for the party as I spent time talking to Z's teacher. When we arrived, the Chairperson was halfway through her speech and the Principal was getting ready for her turn. I was worried that Z might not be able to keep quiet but I was wrong. He was very well behaved throughout. I had the chance to show him where the library is. He was very excited and said he hope jiejie will borrow some books for him too. Honestly, we were quite bored at the party.... We didn't know most of them, only some that I met when I help out for the 3 days. But the Chairperson was nice to try to introduce the rest to us. When the party ended, we were just in time to pick L up. Before I went to the party, I picked Z up from school. Ms B talked to me abt the toilet issue. Daddy mentioned to them this morning. They (Ms B and his Chinese teacher) told me that they do asked if the children want to use the toilet and Z often said no. They said children would rather play than to go to the toilet. I told them that Z can be shy at times and I would appreciate if they ask him. Ms B was glad that I make an effort to talk to them instead of jumping to conclusion and I am to. I understand sometimes children do misunderstand what they were told. Z's teacher is very strict when comes to writing and colouring. I know I shouldn't complain and it is for his own good. But my boy just turned 4! Sometimes, he get upset and told me teacher 'scold' him, for not writing or colouring properly. I need to give him lots of encouragement and good thing is that Ms B often write encouragement words on his worksheets. It helps.... I told her about this too and she is very happy that I do read to Z what she wrote on the worksheets. I do hope things will be better for him, otherwise I can foresee that he doesn't want to go to school. After shopping, we had dinner at a newly opened Chinese restaurant "Huang Jia". Ambience and service are great but the price...... Anyway, I found a writeup abt the restaurant. LZ especially love the seats there, big & comfy. 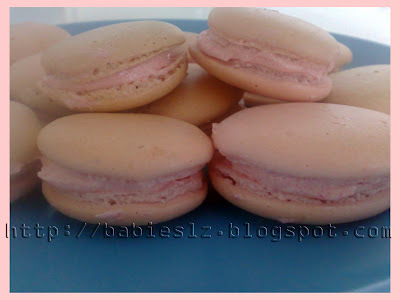 My 1st attempt to bake macarons. From what I know is that if you see the little 'feet', you have succeeded. I think I saw tiny little 'feet' :) It was supposed to be pink but I added too little colouring. Hopefully the next attempt, I will be able to see more of the "feet" and nicer shapes. A reminder for myself, cut down on the sugar the next time. I am glad that Daddy and our little ones like it. Z : Mommy today Ms B did not come to school. Mrs Leong and Ms Lin took care of us. Me : Oh... What happen to her? Z : She is sick and I know why. Me : ....... (almost burst out laughing, trying so hard to control) Baby, I don't think so. I think she talk too much when some of you don't listen to her right? Z : Mmmmmm.... I think so. 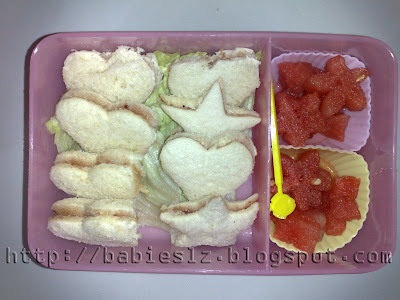 Her snack menu for the day : Butter & strawberry jam shaped sandwiches, watermelon. What do you think? 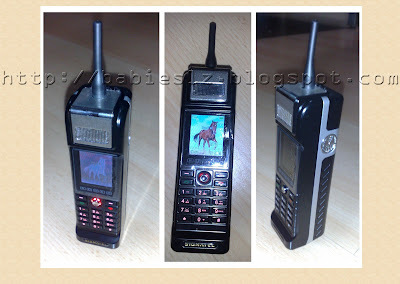 Is this a toy or a real handphone? It is a indeed a real handphone! ;-) Daddy was the owner of this hp for only 2 days. He can't get used to it so he sold it to someone else. When he first brought it home, I laughed! I thought it was a toy. It is very small in size, palm size. It reminds me of the old days when people use a bigger version of this. This hp has most of the functions and it is also a camera phone. Cool right? Z is doing well in K1. I think he is popular with the girls. Hehehe.... Daddy told me that. He used to tell me what he did daily, snacks he ate in school, or anything interesting happen in class, he will tell me too. Then when school reopens, I have to prompt him. After 2 weeks, I am glad that he is back to his old self :) He would tell me! It is great to know what has he been up to in class. One of the things I am still worried abt is the class size... There are 26 of them. I hope my boy is getting enough attention form his teacher. I yet to speak to the teacher abt going to the toilet. I am trying to get him to speak up, to tell his teacher when he needs to use the toilet. The teacher is strict with their writing and colouring. Sometimes, he tells me that teacher 'scold' him for not writing properly. I believe that the teacher meant well..... If she is really mean to Z, I'm sure Z would not want to go to school. Z has been attending English class since last year and feedback from teacher is that he has advanced to the next level. She also said that Z is very good with his reading, compared to his peers. He didn't complained much when we used to walk home. But now, he does... I think Z misses walking home with jiejie, just like me. While walking home, we played games , have their snacks and they 'fight' to tell me first what they did in school. Now, it is just Z and me. Not that he doesn't enjoy walking home with me :) It is more quiet now, nobody 'fight' with him to talk or for the snacks :) So now, he always looks forward to picking jiejie up from school. He would ask me to carry him so that he can look out for L when school dismiss. I am still trying to get used to our new routine but most important is that my babies enjoy school. Everyday after school, she would excitedly tell me what happen in class, any homework (Yes! she has homework since last week) or any messages from teachers. I hope she will continue doing that even when she goes to college. Think too far right? Hehehe..... Yesterday, she came back with her English spelling lists and she said her Chinese language teacher will be giving her the list soon too. I heard from my friends that most school are still in the 'play' mood for the P1 but my girl has already started her lesson since Day 2. One of the things that I like abt the school is that they encourage children to bring a storybook (or borrow from school library)everyday to school. From Mondays to Wednesdays, they are told to bring a English storybook. Thursdays & Fridays, they are encourage to bring a Mother Tongue storybook. While waiting for the flag raising or assembly to begin, they will have silent reading. As for Chinese lesson, she is doing well too. Her Chinese language teacher has a reward programme for them. Whenever they are able to answer her questions or their worksheets are correct, her teacher will give out stickers after the lesson. So far, she has collected 9 stickers. She is looking forward to her 10th stickers coz her teacher will be giving out present to those that have 10 stickers. I think the Chinese Enrichment classes has helped her a lot. Recess.... She has been without buddy for the past 2 days, the buddy system has ended. She gave a buddy a little present to her buddy on the last day. She said she is going to miss her during recess. On Monday, my girl asked my packed some snacks for her but she forgot abt it and bought food from the canteen. Today, she placed order with my 'cafe' again :) She 'ordered' fried rice (forgot to take pic of it). I woke up earlier to cook for her and and placed it in a warmer bag. Tomorrow she has already told me what she wants, some biscuits and crackers. Today, she told me she has a locker and her locker no. is 162! 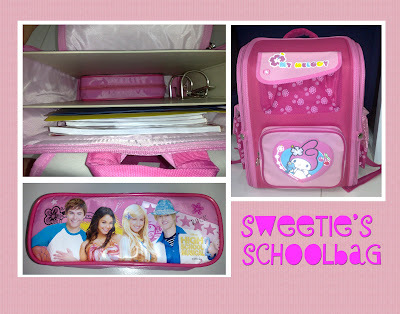 Her teacher told her that she can put things in the locker but no food & drinks to be inside. That also means that my girl will not have to carry many books/things to school. I am so happy that she is enjoying her school life, making new friends and taking up responsibilities. We arrived just in time for the magic show :) The children had fun watching the magic show and games conducted by the magician. Both LZ had a chance to be on stage to participate in the games. Z told me he is very happy today! 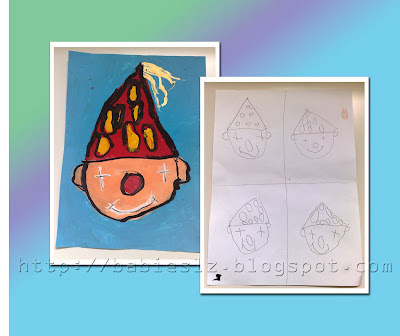 Z: Mommy, you know, I am very happy today in school. Me : That's great! So you are enjoying school! Z : Yes! Ms B sing and play with us and we play toys too. And we go to the play ground. Me : Wow! That's so fun! Z is not going to say he doesn't want to go to school anymore right? I noticed almost everyday after school, Z would want to use the toilet as soon as I pick him up from the hall. I asked if he used the toilet during school hours and he said no. Me : Do you go to the toilet? Z : No... Only when Ms B says we can use then we use. Me : But baby... When you need to use the toilet, you need to use the toilet. Next time you tell Ms B you are urgent ok? Hmmmm... If it carry on like this, I think my boy will have bladder problem soon. Perhaps I should check with the teacher. Z has always been an obedient boy and he obeys what the teachers says. Sometimes, I wish he would learn from his sister, willing to speak up. Me : How was school today? Z never has this problem when he was in N2 . Probably the class was smaller then... Now with 26 kids in the class and the teacher is probably more strict with the kids. Or the teacher is just telling him and he misunderstood the teacher. I asked her if she knows what it means... She said that she has to look after her classmates and to set a good example. Not bad huh? She mentioned that the teacher told her if she misbehave in class, she will no longer be one. I also explain to her that she has to help the teachers and whenever a teacher comes into class, she and her partner will have to remind the rest to greet the teacher. L has been looking forward to her permanent teeth. The Day has arrived! But I'm not sure if we should go to the dentist to pull it out or let the baby teeth drop out on it own..... Will it affect the growth if we leave it to drop out on its own? 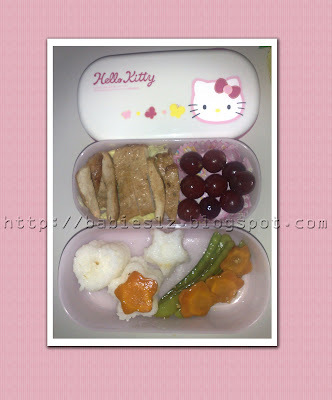 Her first bento for school. After the first day of school, L asked if I can prepare her snack box again. This time she wanted home cooked food, pasta or rice. My girl thinks she is in a cafe and she is placing order. Hehehe.... I know I know.... I was supposed to encourage her to buy food instead but I can't say no to her for craving for my cooking :p So yesterday I woke up at 5+am to cook! 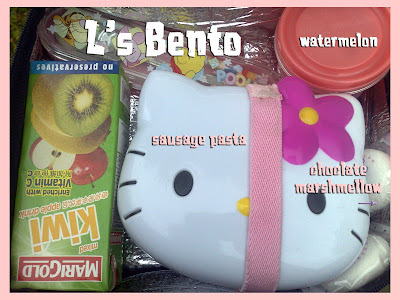 I prepared sausage pasta, cut watermelon, juice and 2 chocolate marshmallow. LZdaddy sent it to school before her recess so that she had warm food. Our efforts paid off after seeing her polishing off everything (except 1 marshmallow). L bought her food from the canteen and I was the one that showed her to the store instead of her buddy. She queued up on her own and bought a plate of chicken rice. She took a long time to finish her food and when the bell rang, her buddy was helping her to pack up. Haiz... My girl is a slow eater... I hope she will do better and finish her food before the bell ring. She has been saying that she wants to visit the school library but I don't think she will have time. She used up her 30 mins recess for meal for the past 3 days..
Today is the last day I help out the teacher and it was a good experience for me. After morning assembly, the teacher thank us for the help and said she doesn't need later. I stayed on anyway coz L was having her mass PE and I want to see how she was doing. Another parent volunteer had to stay on so I decided to help her out. By then, most of the volunteers already left the school except 2 of us. We stayed till after recess and I was glad I did that. The parent volunteer that I was helping have another 5 kids without buddy! A promise is a promise :) My boy happily went to school today! Yippee! I think he is slowly getting used to it. Well done baby! LZ woke up at 0645hr.... By 0720hr, we were out of the house. My poor boy... He doesn't need to wake up early but daddy had to send us to jiejie's school and I won't be there to get him ready if he wakes up later. We'll try to adjust the timing next week when I'm done with the volunteer work. Being a PSG member, I was able to send my girl to the hall and stay there with her. The school does not allowed parents to enter the school even for the first day. I settle my girl with her classmates and teacher and I began my duty as a parent volunteer, guiding the P1 children to their respective line. I was surprised to know that some parents did not tell their kids which class are they in and no class name was written in their books or bags. 5 minutes before recess, their buddies (P5 students - each were assigned to take care of 1 P1 student during recess) were supposed to come and get them but there were 5 students from my class that were without buddies. My partner and me took them to the canteen instead. Then we realised 1 of the kids did not have any money nor food with her and she was hungry! Poor girl.... My partner bought a plate of rice for her. How was Z doing? Daddy smsed me during the assembly and told me Z didn't want to go school initially but he managed to pacify him. So after recess, I told my partner I had to go see my boy. I promised him I will be there on his 1st day too. When I arrived at his school, they don't allowed parents to be in there! *SOB* Parents were allowed for the 1st hour only.... Finally at 1000hr (1 1/2 hr of lesson for the 1st 3 days), I was allowed to go in to pick up my boy. We were so happy to see each other! :) When I asked him how was school, he said he didn't like it.... :( I hope things will be better after a few days.... He is probably not used to waking up early, change of teachers and I was not with him. Z fell asleep as soon as we got home.... After the nap, we picked jiejie up from school. Well, I must say that L did very well for the first day :) and she is happy to see her new friends that she met on Orientation Day. I am sure Z will get used to it very soon too. For me, I hope I can get along with the PSG members. 1 or 2 of them look so stuck up and unfriendly but I am glad my partner is a very nice lady. When I tried to smile or greet them, they give the so-you-are-new look. My hubby has been very supportive of me joining the PSG member and he joined in too (ad hoc basis). He said if I am not happy being a regular volunteer then I should quit and relax at home. But he knows that I am doing this so I get to see my girl more often and to know the school/teachers more. As soon as we got home from the gathering, L and me packed her school bag. It was easy to pack as we were given a list..... L packed the things and I make sure that everything she needs was in the bag. She was excited with her school bag and her pocket $$$$$! We gave a $2 (coins) and hopefully she doesn't use all of it. This was not the first time she used a wallet. I bought last year... Sometimes when we go out, she carried it with her but she never used it so she gave up bringing it along. When we buy snacks, I would usually passed her the money and make sure she got the right change. I hope she will be able to handle it well :) I am relieved to know that they will assign a P5 student to take care of them during recess for the 1st 2 week. Being a worried mom, I told her what to expect and what to do during recess. 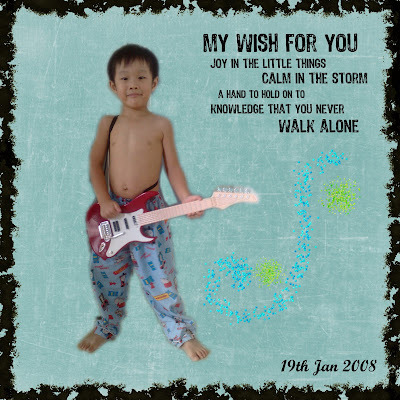 As for Z, we told him he will be going to the jiejie's old school (same school but different compound). I am worried that he will not want to go to school tomorrow. He missed his previous teacher and he once mentioned that he doesn't want to go the other side. I wouldn't be able to see how is he doing tomorrow but I am glad daddy took leave to be with him. Hope everything will be fine for all of us. 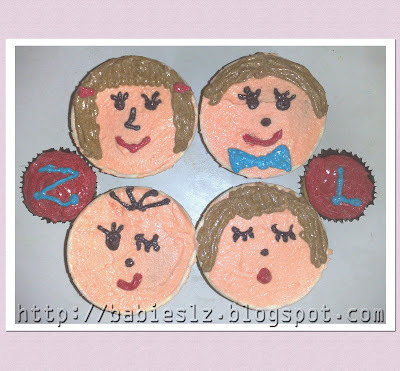 L has a good form teacher & friends, Z doing well in class and me, get along well with the PSG members. Godma bought a name tag keychain for L, so that she can placed it on her new school bag. Being a fair person, she bought something for Z too, M&Ms. Thank you my friend :) LZ enjoyed godparents company and playing with Javier too.